For hundreds of years the people living in the small towns and villages around the North East coast earned their living from the sea. This was not just in larger ports like Peterhead and Fraserburgh, but also in the small villages like Portsoy, Cullen, Portsoy, Gardenstown and many others. Task: Look on a map of the North East of Scotland and see if you can find more towns or villages along the coast where the fisher folk would have lived and worked. People from the fishing communities rarely met or mixed with those from the countryside. "Cod and corn dinna gaun the gither" was a saying of the time. This meant young people usually got married to the son or daughter of another fishing family which led to many families in the village having the same surname. This could be very confusing, so people were given "teenames" or nicknames. Sometimes they used the name of a person's house or boat. For example, if James Duthie's boat was called "Seahorse" he would be called James Duthie "Seahorse" and his son, Sandy, would be "Seahorse's" Sandy. If Sandy then had a daughter, Annie, she would be known as "Seahorse's" Sandy's Annie. 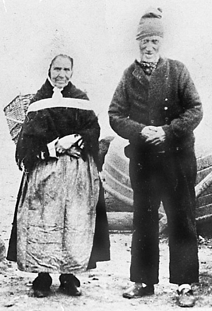 In the picture above we see an old fisherman and his wife. It was taken more than a hundred years ago. Imagine being able to talk to them. They would have some wonderful tales to tell. I wonder what his "teename" might have been? Task: See if you can make up some teenames for some of your class-mates. You could use their hobbies or interests to take the place of the names of boats. 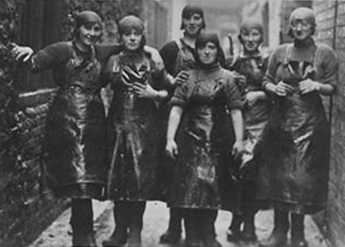 Although it was the men who went off to sea to catch the fish women also played a vital role in the fishing industry. They carried out many of the important tasks which were necessary before the men could go to sea, like preparing and mending nets, gathering bait and baiting the lines. In the picture above we see a woman baiting a fishing line. The line, which might have a hundred hooks attached to it, is in the basket and the bait, mussels or buckies she and her children would have collected from the rock pools earlier in the day, is in the bowl on the ground in front of her. Some women helped their families make a living by walking several miles into the surrounding countryside with creels of dried fish. They would either sell this to the folk who lived on the farms or in the country villages or barter and trade their fish for farm goods such as milk, eggs or butter. This was back-breaking work as the creels of fish were heavy and they walked the roads in all kinds of weather. In this picture a fish-wife poses for a studio photographer with her creel on her back. In the smaller villages where there were no proper harbours, the boats were launched from the shore. 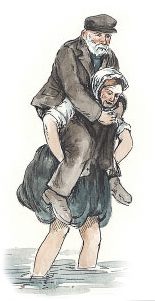 Women then carried their men-folk out to the boats on their backs so that they could set to sea in dry clothes. I'm not sure if women would do that today. What do you think? 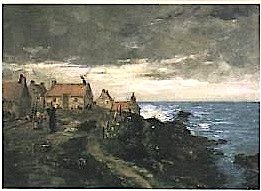 If you look at the picture of Broadsea, a fishing village on the west side of Fraserburgh, you will see that the houses were built quite close together, but not facing the sea. Can you think why this might have been? Inside the houses were quite small and bare. There would be a single open room with an earthen floor below roof beams blackened by peat smoke. Fishing gear was stored on top of the beams and fish, bunches of onions and rush-pith for wicks for the "eeley dolly" lamp would be hung from the beams to dry. An iron crook held the cooking pots over the fire which burned locally cut peats. A wooden dresser stored the utensils and a box bed in which the family slept were largely the only two items of furniture. The smell of fish, damp clothes and the peat fire would have filled the room. Buchanhaven as it looked a hundred years ago. 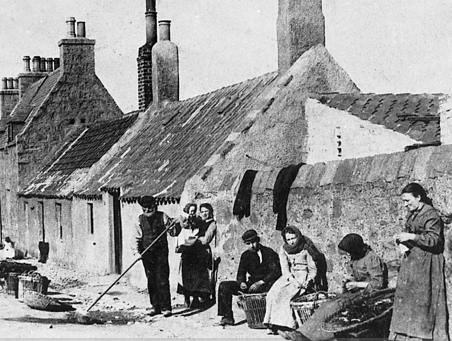 At that time it was a village just north of Peterhead but is now a part of the ever spreading town. Fraserburgh Harbour cram packed with sailing drifters in the 1880s. It was said that when the whole fleet was at rest on a Sunday you could walk from one side of the harbour to the other over the decks of the boats. In the late 1800s and early 1900s there was great demand for cured herrings, especially in Russia and the Baltic states. The fleets of boats grew steadily to meet the demand and so too did the industry on shore for barrel makers and herring gutters. 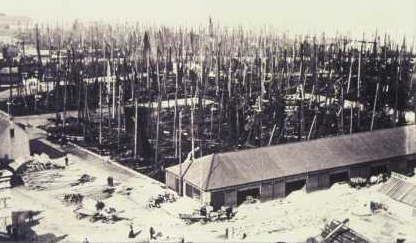 The process of curing herring meant that the fish had to be gutted and packed into barrels with salt as soon as the boats brought their catch ashore. The boats fished at night and brought their catch in at daybreak. This meant a very early start for the crews of gutters and packers. 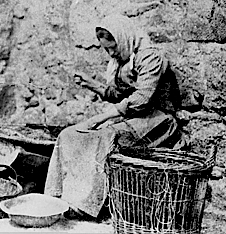 Thousands of women and girls were employed in this way as the harbours swarmed with activity during the herring season. Gutting crews at work at a Peterhead curing yard. The herring were carted from the quayside and salted as they were poured into the "farlane," the big wooden trough where the gutting teams worked. 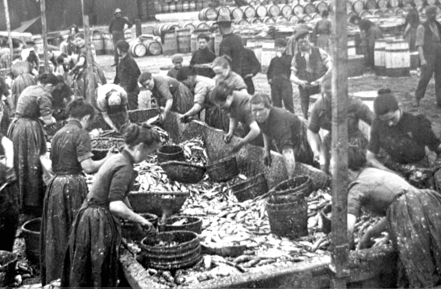 They worked at great speed, some skilled gutters could clean as many as 60 herring in a minute, gutting the herring with razor sharp knives and packing them into barrels. In the background we see hundreds of barrels stacked and ready to be filled. 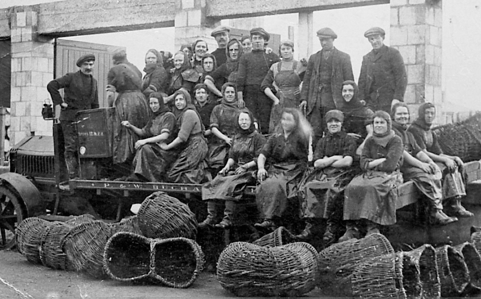 The men and boys in the picture are coopers (barrel makers) and their apprentices. They made the barrels, and once the women had filled them with herring, it was the coopers' job to put the lids on and seal them. The older children looked after their younger brothers and sisters while their mothers worked dawn till dusk shifts at the curing yards. The herring fishing began in the late spring and early summer up in the Shetlands. 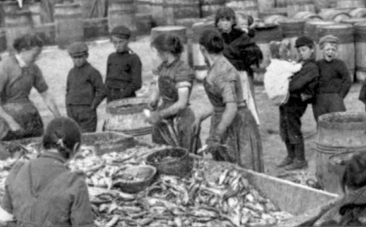 Hundreds of gutting quines were ferried up to Balta Sound to work in the curing yards. Their belongings were taken in kists by the fishing boats crewed by their fathers, husbands and brothers. By mid summer the herring would have moved further south and the ports of Fraserburgh and Peterhead became the main fishing stations. 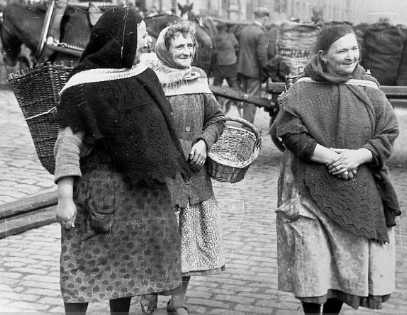 Three Buchan "wifies" with their wicker creels and baskets on the quayside at Peterhead. In the background we can see a pair of horse drawn coal carts delivering coal to power the steam drifters' engines. A good herring season meant work, and a good wage, for everyone in the town. Later in the year the fleets of boats went south to Grimsby and then Yarmouth for the last of the fishing. Special trains left Fraserburgh and Peterhead to take the girls south. "We went to Yarmouth and Lowestoft by train. Ye never went to sleep. All the guttin' crews would be singing and dancing. Oh it was fun! I wish it was those days now! We worked down on the Denes. We wore oilskin skirts and rubber boots. Packing herrin' was the cleanest job. Ye'd only the salt tae worry aboot. With the gutting, ye didna cut yersel if ye tied yer fingers richt way bits of rag. But, if yer hands were cut! Oh me! It was the salt that did it. Oh aye, it would eat into yer hands." 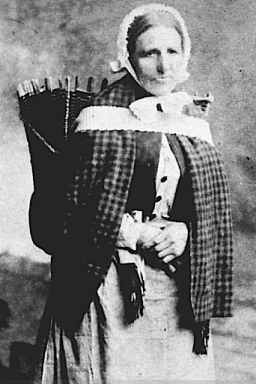 Annie Watt of Peterhead, who first went to the Yarmouth fishing in 1907 when she was 15 years old. A few years later Annie married a Yarmouth fisherman and settled in the town. Gamrie "guttin' quines" near their digs in the Yarmouth Rows, Great Yarmouth, in 1925. Though the work in the curing yards was hard there was always a good sense of humour and friendships were very strong. The girls looked forward to their trips away from home and the chance to experience life in different places. Few working class people could share such adventures in those days. The curing yard crew - "Guttin' Quines n' Cooper Loons" outside the yard on the curer's lorry. The days of the travelling coopers and quines are long gone and their work is now done by machines in harbour factories.